Minimizing reception at the image frequency is fundamental to useful practical application of the superheterodyne principle—unless the image happens to lie in another amateur radio band, and you want to receive it. This page explores the band-imaging receiver topology popularized in the 1950s by Byron Goodman, W1DX—a design approach that uses a single local-oscillator tuning span to receive either of two bands without oscillator-tank switching, each band the image of the other. It will be noted that the same oscillator coil, D, is used for two frequency ranges. This is possible because the oscillator signal is placed on the low-frequency side of the signal on the higher range. This not only avoids winding a second coil, but also gives somewhat greater stability at the highest-frequency range. . . .
A word about images. The receiver will, of course, respond to signals either 1600 kc. higher or 1600 kc. lower than the oscillator frequency. The unwanted response, or image, is discriminated against by the tuning of the r.f. circuit. On the three lower-frequency ranges, when it is possible to find two tuning spots on C1 at which incoming random noise peaks up, the lower-frequency peak (the one requiring the highest tuning capacity at C1) is the right one. The oscillator frequency is 1600 kc. higher than that of the incoming signal on these three ranges. On the fourth range the reverse is true, since here the oscillator is tuned 1600 kc. lower. Actually, it does not matter a great deal which side is used except for calibration purposes. Figure 1—Schematic diagram of the 6K8–6C8G superheterodyne/regenerative-detector receiver. Band imaging is used on its upper two tuning ranges as shown in Figure 2. The intermediate frequency used is approximately 1600 kHz. 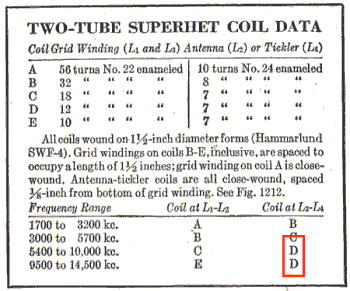 In a post-World-War-2 ARRL Handbook or two (the 1948 edition, for example), the 6C8G was replaced by a 6SN7 and slug-tuned, shielded National Company coil forms were used. Figure 2—Coil specifications table for the 6K8–6C8G superhet-regen receiver. The red box highlights the use of the same RF coil for two tuning ranges, the frequency relationship between which reflects band imaging. 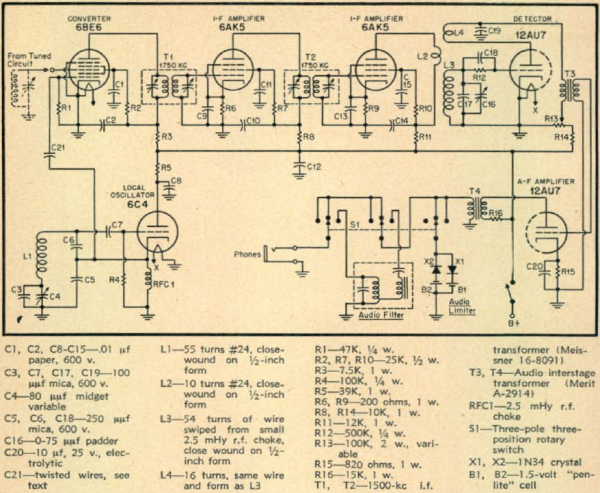 The two-bands-for-the-price-of-one story of the band-imaging receiver continued in earnest in 1950 with the publication in March 1950 CE QST of "A Beginner's Four-Tube Superhet Receiver," by Don Mix, W1TS, and in July 1950 CE CQ of "The Secret Weapon" by Howard J. Hanson, W7MRX. Examining both in detail provides strong clues to why Hanson's each-band-the-image-of-the-other approach prevailed and (likely) served as the basis for later ongoing work by Goodman. Designed to keep the cost of a first-time amateur radio station down, Mix's receiver provided coverage of two bands at a time (principally, 80 meters [3.5 to 4.0 MHz] and 40 meters [7.0 to 7.3 MHz], although coverage of the 20-meter [14-MHz] band could also be installed, and may have been added as an afterthought) without switching or unplugging any frequency-determining components. Unlike Grammer's simple receiver, Mix's circuit uses band-imaging as a fundamental feature: The receiver covers its two principal signal-frequency ranges with one local-oscillator (LO) tuning span (5.0–5.8 MHz), which converts both bands to a relatively high (1.5-MHz) IF to allow selection of LO−IF or LO+IF with simple signal-frequency filtering, one range the image of the other. The novelty of Mix's implementation is that coverage of the two bands is arranged end-to-beginning on the tuning dial, with 4.0 MHz on the 80-meter band (LO, 5.5 MHz) corresponding to 7.0 MHz on the 40-meter band (Figure 3). Only retuning the RF-input grid of the 6SB7Y converter is necessary to change from one band to the other. Figure 3—Don Mix's band-imaging arrangement tuned the 80-meter amateur radio band (3500 to 4000 kHz, orange) and the 40-meter amateur radio band (7000 to 7300 kHz, blue) with a single 800-kHz-wide local-oscillator tuning range (5000 to 5800 kHz). The single tuned input circuit cannot be expected to provide too much selectivity. Even the high intermediate frequency, which increases the frequency gap between the desired signal and its image, does not result in sufficient separation to take care of a strong image from a local ham station. With the tuning range selected, it will be noted that the images of each of the two ham bands fall outside the other. Therefore a strong local ham signal in one band will not cause interference in the other. A fundamental aspect of Mix's design would have been as problematic in 1950 as it is today: 1500 kHz, the design's intermediate frequency, lies within the mediumwave broadcast band. Any builder within day or night range of a broadcaster on that frequency—for example, a 50-kilowatt station on that frequency has served Washington, DC, and the mid-Atlantic region since 1941—would to some degree have heard its signal interefering with the receiver's IF. Published in July 1950 CE CQ, "The Secret Weapon" by Howard J. Hanson, W7MRX, included in one portable package an 80- and 40-meter Boosted Pierce transmitter and an 80- and 40-meter band-imaging receiver that maximized use of the set's reduction tuning dial at amateur frequencies. Figure 4 diagrams its band-imaging scheme and Figure 5 shows its schematic diagram. The receiver is designed to tune 3500–4000 kc and 7000–7500 kc, which it does with some slight overlap. To simplify the band changing problem, the intermediate frequency was chosen as 1750 kc, and the local oscillator covers a frequency of 5250–5750 kc. This means that with the local oscillator at 5250 kc, either 3500 kc or 7000 kc will beat with it to produce the required 1750 dc. The antenna tuner [included with the transmitter] and the [transmitter output] tuned circuit will eliminate one of the two images, allowing only the other to come through. Figure 4—Howard Hanson's "Secret Weapon" band-imaging receiver maximized tuning-rate reduction by reducing the set's tuning range to 500 kHz and aligning the lower edge of the 80- and 40-meter bands at the same point on the dial. This necessitated the use of a 1.75-MHz IF ([7000–3500] divided by 2) and required an LO tuning range of 5250 to 5750 kHz. Without prodigious shielding and interstage filtering, harmonics of the set's 1.75-MHz regenerative detector would be audible at 3500 and 7000 kHz—arguably a plus, as these signals could serve as built-in tuning markers. (Which markers—as evidenced by a receiver at W9BRD that uses this conversion scheme—may have a somewhat unusual sound for the reason that with its local oscillator tuned to 5250 kHz for reception of 3500 and 7000 kHz, the receiver hears not only its second and fourth IF harmonics, but also the results of interaction between the third IF harmonic [5250 kHz] and the local oscillator signal.) The use of 1750 kHz as the set's intermediate frequency avoided the broadcast-station IF interference that likely troubled builders of Mix's receiver in (at least) the US Northeast. Figure 5—The schematic diagram of Howard Hanson's "Secret Weapon" band-imaging receiver. The output tuned circuit of the Secret Weapon's Boosted Pierce transmitter was switched from the transmitter to the 6BE6 input with the set's transmit-receive switch set to Receive. Three years later, Byron Goodman, W1DX, improved on Hanson's band-imaging arrangement with the publication of "A Good Four-Tube Superhet" on pages 19–24, 108, 110, and 112 of January 1953 CE QST. In his evolved approach, Goodman again converted 80 and 40 meters to a high IF (1.7 MHz), but this time used double-tuned-circuit front-end filtering for greater image rejection. This required use of an LO span (5.2–5.7 MHz) that spread 80-meter coverage across the entire dial while centering 40-meter coverage in the middle 3/5 of the dial (Figure 6). As in the Mix and Hanson receivers, Goodman's choice of IF made the even-100-kHz points of both bands coincide for friendly dial-calibration ergonomics. Goodman further improved on the Mix and Hanson designs by using double conversion—in this case, again converting the set's 1.7-MHz IF to 100 kHz for additional selectivity. Figure 6—Made practical by greater image rejection from double-tuned-circuit front-end filtering, Byron Goodman's band-imaging arrangement also overlaid 80- and 40-meter coverage through use of a 500-kHz-wide local-oscillator tuning range. The IF is 1700 kHz, the second harmonic of which falls outside the 80-meter band. Goodman's choice of a 1.7-MHz first IF avoided the IF broadcast interference that likely occurred with Mix's 1.5-MHz-based design in some areas of the world. With the upper limit of the mediumwave broadcast band having since been moved to 1705 kHz, receivers that use a 1.7-MHz IF can now be interfered with by broadcast stations operating at that frequency. Hanson's choice of 1750 kHz for an IF still passes the test of time. George Grammer, W1DF, "A Two-Tube Superhet," QST, February 1941 CE, pages 12–15 and 92. Donald H. Mix, W1TS, "A Beginner's Four-Tube Superhet Receiver," QST, March 1950 CE, pages 11–17; Feedback, QST, June 1950, page 39. Howard J. Hanson, W7MRX, "The Secret Weapon," CQ, July 1950 CE, pages 26–28, 58, 59. Byron Goodman, W1DX, "A Good Four-Tube Superhet" QST, January 1953 CE, pages 19–24, 108, 110, and 112. Byron Goodman, W1DX, "The '2B3' Superheterodyne," QST, September 1955 CE, pages 12–15. Lewis G. McCoy, W1ICP, "A Selective Converter for 80 and 40 Meters," QST, January 1956 CE, pages 38, 39, 130, 132. Lewis G. McCoy, W1ICP, "The 'Bonus' 21-Mc. Converter," QST, October 1958 CE, pages 33–35, 162. Byron Goodman, W1DX, "The 'SimpleX Super' Receiver," QST, December 1958 CE, pages 11–14, 178, 180. "The 'SimpleX Super Mark II' Three-Tube Receiver," The Radio Amateur's Handbook (ARRL), 1962 CE edition, pages 116–119. "The 2X4+1 Superheterodyne," The Radio Amateur's Handbook (ARRL), 1962 CE edition, pages 120–124. "The HB-65 Five-Band Receiver," The Radio Amateur's Handbook (ARRL), 1965 and 1966 CE editions. Wes Hayward, W7ZOI, "Building Spectral Purity into a Band-Imaging Transceiver," QST, August 1990 CE, pages 39–40. Ron D'Eau Claire, AC7AW, "The Simple Superhet," QST, November 2003 CE, pages 31–37. This design converts the 7- and 14-MHz amateur radio bands to an IF of 3.5 MHz—using 12-V-plate-and-screen tubes. More will be included, from two in Solid-State Design for the Radio Amateur to my 10- and 18-MHz design in the 1988 CE Radio Amateur's Handbook to multiple 80-and-20-meters-to-9-MHz-with-a-5-MHz-VFO derivatives from the growth-of-SSB-ham-radio era to the Panasonic RF-2200 and related multiband receivers, the HF coverage of which was implemented as three pairs of imaged bands based on a first IF of 1.985 MHz. This last topology is impractical because of its significant built-in crossover responses: Harmonics of the LO interfere with IF (at 3LO) and RF on 80 meters (2LO) and 40 meters (4LO) when the LO is tuned to 1.78333 MHz to receive 3.5666 MHz or 7.1333 MHz. Considering these relationships for awhile, we realize—assuming that we want to cover only 80- and 40-meter frequencies commonly used for CW operation (3.5 to 3.6 MHz and 7.0 to 7.125 MHz)—that only an IF higher than 5.4 MHz will do. Better yet, the true band-imaging scheme described by Goodman (using a 5.2- to 5.7-MHz LO to tune 3.5 to 4.0 MHz and 6.9 to 7.4 MHz with an IF of 1.7 MHz) is crossover-free. None of my Mix-Goodman receivers includes a crystal filter or equivalent close-in band-pass selectivity. The BG-1 is an 80- and 40-meter, 1.7-MHz-IF Mix-Goodman receiver I've been developing since late 2005 CE. 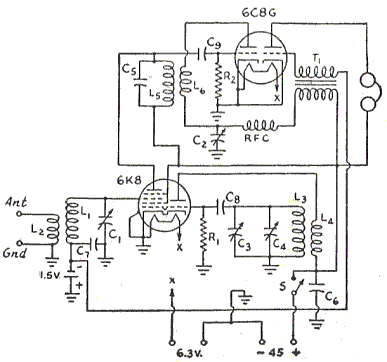 In its initial configuration it used a 12SG7 pentode RF amplifier; BF998 dual-gate-MOSFET mixer; repurposed Kenwood R-599 VFO (4.9–5.5 MHz); 12SK7 pentode (triode-connected) IF cathode follower; 12SJ7 pentode high-C Hartley regenerative detector; 12SC7 dual triode (one section) audio voltage amplifier in the headphone chain; 2N3819 JFET voltage amplifier in the headphone chain; 2N3819 JFET line-output voltage amplifier; and 12A6 beam power tube (triode-connected) as a cathode-follower headphone amplifier. The BG-1's high-C regenerative detector is the result of experiments inspired by the stability of the 40-meter regenerative receiver I published in September 1992 CE QST. The detector in that design used a total of about 200 pF as its tuned-circuit capacitance—at 7.04 MHz, a reactance of 113 ohms, which, scaled to the 1.7-MHz IF of the BG-1, equates to about 820 pF. With the notable exception of the intentional use of relatively high C by George Grammer, W1DF ("Rationalizing the Autodyne," QST, January 1933 CE, pages 11–16 and 23), ham-radio practice up through the 1930s generally held that regenerative detectors should be relatively low-C—that is, that a regenerative detector's tuned circuit should exhibit a relatively high impedance for the purpose of achieving higher tank voltage. Yet my experience with high-C detectors reveals that a storied principal weakness of the regenerative detector, "pulling in" when the frequency difference between the detector and strong signals is no more than a few hundred hertz, can be greatly reduced by using a high-C detector tank. Ongoing experiments with the BG-1's audio lineup resulted in its present configuration: 12SC7 dual triode (one section as audio-filter "send" amplifier, the other as audio-filter "receive" amplifier); 12SC7 dual triode (one section as audio voltage amplifier in the headphone chain, the other section as audio voltage amplifier for line output); and triode-connected 12A6 beam power tube as headphone amplifier. Switchable surplus audio filters between the sections of the first 12SC7 allow a choice of no filtering; 400-Hz low-pass filtering; and 1-kHz low-pass filtering. The BG-2 began as 3- to 6-MHz "Command" receiver (IF, 1.415 MHz) that I obtained with the intention of expanding its tuning range through band-imaging by building out its RF amplifier stage to include switchable coils to cover spectrum below its local oscillator (its original design) and above its local oscillator (giving 40-meter amateur radio band coverage in the resulting 5.83- to 8.83-MHz range). In evaluating the receiver, however, I discovered that a previous owner had modified it to cover only 3.33 to 3.83 MHz by removing all but three rotor plates from each of the three sections of its tuning capacitor. (Hint: Removing plates from a variable capacitor to reduce its capacitance range is almost never necessary; paralleling a variable with additional capacitance and seriesing the pair with another capacitance is one non-destructive, reversible alternative.) A toggle switch, two air-dielectric trimmer capacitors and a 40-pF padding capacitance later, I had modified the local oscillator to provide reception from 3.475 to 3.640 MHz and from 6.995 to 7.180 MHz. High-C (420 pF at 3.5 MHz), single-tuned mixer grid for good-enough input selectivity. Using the set in conjunction with the additional signal-frequency selectivity afforded by the station's coax-to-ladder-line antenna tuner, I have yet to hear an other-band image. Oscillator buffer amplifier for better oscillator and mixer stability. 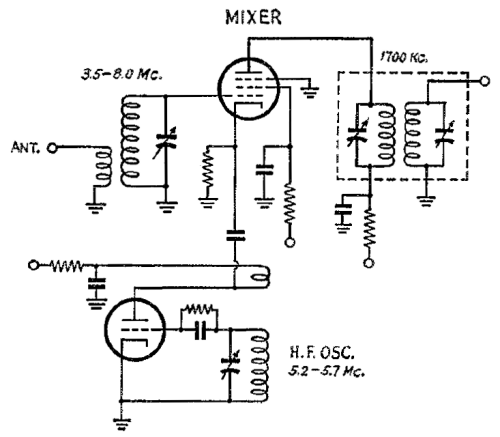 In his writeup (December 1953) for his first Goodman-Mix design that used a pentode mixer with cathode LO injection (Figure 7), Goodman mentioned encountering oscillator-pulling and mixer-regeneration (that is, mixer oscillation) effects as the mixer grid is tuned through its range. (In my experience, the pulling is worse when the mixer grid tuning is varied around 3.5 MHz [at the LO frequency, a changing inductive X at the grid] than at 7 MHz [at the LO frequency, a changing capacitive X].) Direct capacitive coupling between the sets' mixer cathode and LO tuned circuitry is the cause; addition of a triode cathode follower between the oscillator and mixer is the cure, entirely eliminating mixer instability and reducing ocillator pulling to zero (as the mixer grid tuning is varied around 3.5 or 7 MHz) or to a hundred hertz or so (as the mixer grid is tuned through the LO frequency). I added a LO buffer in the BG-3 by using a 5963 (premium 12AU7A for computer use) dual triode as combination LO and buffer tube. For economy, the buffer and 6AZ8 pentode mixer can share a common cathode resistor (910 or 1000 Ω); using separate mixer and buffer cathode resistors (1500 and 2200 Ω, respectively) and ac-coupling the buffer and mixer cathodes with 0.001 µF also works. The addition of the LO buffer slightly strengthens the set's 2LO–IF response (circa 8.7 MHz), perhaps as a result of LO-signal distortion in the buffer. Figure 7—After having used a 6SB7Y pentagrid first converter in his initial band-imaging receiver (January 1953 QST), Goodman used variations on this circuit, a pentode with cathode oscillator injection, for all but his final band-imaging design (the 7360-beam-deflection-tube-mixer-based HB-65 receiver of the 1965 and 1966 CE editions of the ARRL Radio Amateur's Handbook). The direct coupling between the oscillator and mixer result in two shortcomings that make this arrangement problematic: Couplng the oscillator's feedback coil to the mixer cathode makes the mixer regenerative—it can oscillate, especially when its grid is lightly loaded and/or with lower values of cathode resistance—and tuning the mixer grid pulls the oscillator somewhat, even at 3.5 and 7 MHz. (Versions that use a triode-pentode tube with the pentode suppressor grid hardwired to the pentode cathode [6U8, 6EA8, and so on] for the mixer and oscillator functions also have the shortcoming of capacitively coupling the LO signal to the pentode plate; using a 6AZ8, 6CH8, or 6KT8 and grounding the correct heater pin ; or using a 6CL8 triode-tetrode, solves this problem.) 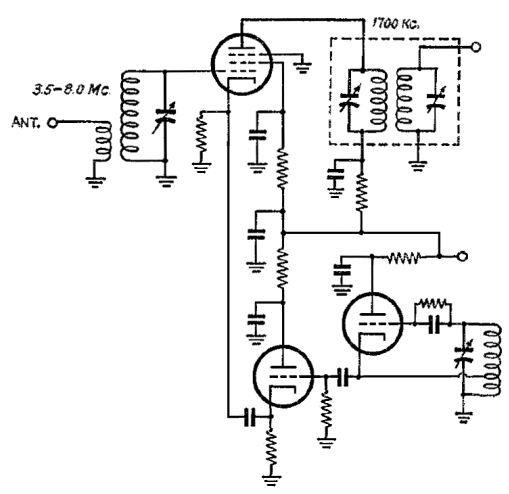 This concept-only depiction does not show the double-tuned mixer grid circuitry Goodman used to improve image rejection in several variations of this circuit. Getting the oscillator signal into the grid circuit of the pentode mixer takes a little doing, and it isn't just a matter of running a coupling condenser over to the 6AC7 grid. This will work at higher frequencies or with a lower i.f., of course, but here we had a choice between inductive coupling and cathode injection, and decided on the latter. As can be seen from the revised wiring diagram . . . a 0.001-μF condenser is connected between the oscillator plate and mixer cathode. Thus the r.f. voltage appearing across the plate coil of the oscillator is applied across the 1500-ohm cathode resistor of the mixer. The oscillator still oscillates, of course, and is as stable as when running unloaded. The mixer will be regenerative and can oscillate if the gain is too high, but with the values given the mixer is completely free from oscillation. In a mixer of this type, the high-frequency oscillator voltage swings the grid at an r.f. rate through wide changes in mutual conductance. If the oscillator voltage is too low, the conversion efficiency will not be as high as it can be made, and the oscillator voltage should be such that it swings to within a fraction of a voltage of running into the grid-current region, although it does [not] appear to be critical. With the values shown, the cathode bias runs a little higher than 2 volts and the sceen voltage is down around 60. With the antenna disconnectd, the mixer is still slightly regenerative (as indicated by the sharp peaking of the input circuit C1-L1-L2), and if the 1500-ohm cathode resistor is reduced in value to 680 or 1000 ohms the mixer will oscillate. The best value of cathode resistor is the lowest one that makes the mixer regenerative without oscillation when the antenna is disconnected. Figure 8—Adding a buffer amplifier between the mixer cathode and oscillator removes the primary cause of mixer regeneration and reduces pulling to essentially zero at 3.5 and 7 MHz and to tens of hertz at the LO frequency. (The mixer is still somewhat regenerative because of the Colpitts capacitive voltage divider formed by the 6AC7's grid-to-cathode and capacitance and the cathode-to-common capacitances of the 6AC7 and oscillator-buffer triode.) This depiction shows a Hartley oscillator; the Armstrong oscillator (tuned grid with feedback via a plate ticker coil) used by Goodman would work as well with the buffer grid coupled to the oscillator plate. The mixer and buffer cathode resistances can be combined into a single resistor if the cathodes are dc-coupled; capacitive coupling between them allows separate cathode-bias adjustment of both stages. Both approaches have been tried and work well. With a 47-Ω resistor between its grid and input tuned circuit, Goodman's original high-transconductance-pentode band-imaging mixer (based on the 6AC7 as described in December 1953 CE QST) is also stable across its full input tuning range with this circuit. Subharmonic locking for reduced detector pulling. I experimented with lightly coupling (through 1 pF) the tank circuit of the set's 1.7-MHz 6AZ8-pentode regenerative detector to the plate of a 3996.5- or 5100-kHz Pierce crystal oscillator (12J5 tube) and adjusting the detector tuning for subharmonic lock with the crystal frequency. Having used this technique to obtain transmitter drive at crystal subharmonics, my thought was that pulling an oscillating detector to a very strong local signal could increase its practical dynamic range by making it less pullable by strong on-air signals. This experiment failed because the high-C detector was already so pulling-resistant that I could not make it lock stably across the expected regeneration-control range (from below to well above critical), and because even with the detector ostensibly locked, unpleasantly loud unlock-relock thuds sometimes occurred as regeneration was adjusted through critical in the presence of strong on-air signals. Resistive RF input-level control. A 1-kΩ potentiometer, stator toward the mixer and rotor toward the antenna, provides the RF level adjustment capability necessary for bringing strong signals within the frequency-pulling dynamic range of the set's regenerative detector. (I have long considered the detuning-for-level-control technique unacceptable.) Eliminating mixer regeneration through the addition of the oscillator buffer was key in maximizing the smoothness of this control; with regeneration present the mixer was more prone to oscillation with the control adjusted to either end of its range. 12SJ7 regenerative detector. In trying regenerative detectors using 6AZ8 and 12JN8 (12.6-V 6GH8 with different pinout) pentodes and 1.7-MHz tank LC values comparable to those in the pulling-resistant BG-1 detector, I found them disappointingly pullable. Switching to a 12SJ7 (Figure 7) duplicated in the BG-3 the results achieved with the BG-1. From subsequent research and a series of experiments at 455 kHz and 1.7 MHz using 6AK6, 12K7, 12SK7, 12A6, 12V6, and 1631 tubes, I infer that lower grid-to-screen µ generally makes for a less-pullable screen-grid regenerative detector, and that true pentodes are generally better than beam power tubes. (Nonetheless, the 12A6, 6V6/12V6/6AQ5/12AQ5, and other "beam power" tubes can make very good detectors, as I'll describe elsewhere as time allows.) The grid-to-screen µ of a 12SK7 is 19; of the pentode portion of more modern tubes like 6AZ8 and 12JN8, 40 or more. Cascoded-triodes synthetic tetrode regenerative detector (http://www.dk3bi.de/index.php?id=7). A 13DE7 dissimilar dual triode, wired as a pin-for-pin replacement for the 12SJ7 (suppressor connection ignored, higher-µ section connected to the Hartley tank, grid of the low-µ section acting as screen grid) provided equal to superior pullability, and higher gain, compared to the 12SJ7 (Figure 10). A 5963, 5814A or 8CG7/8FQ7 dual triode provided similar results with lower heater drain (and therefore less heating of the small receiver enclosure); in practice, I use a 5814A, 5963 or 7AU7, or triode-connected 6AK6s. Figure 10—Cascode-connecting the two triodes of a dual-triode tube (in practice, I use a 12AU7ish dual triode or triode-connected pentodes) forms a synthetic tetrode that I find is quieter (less hissy) and offers smoother regeneration control than the 12SJ7 pentode. The IF-Agile Receiver exists only in idea form at present. I envision it as using a single LO range (5.1 to 5.7 MHz or so) to cover multiple MF/HF ham bands through the use of switchable front-end filtering and selectable IFs at appropriate CPU-clock-crystal frequencies, with NE602 Gilbert Cell ICs used as its converter and product detector. David White, WN5Y, has pioneered the IF-agile idea with his high-performance Electroluminescent Receiver, a four-band band-imaging design with switchable IF filters at 3.547 and 4.000 MHz. Revised December 26, 2015 CE. Copyright © 2007–2015 by David Newkirk (david.newkirk@gmail.com). All rights reserved.